Last summer I met a Wyoming rancher who was convinced that aliens from outer space mutilated the dead cows he would occasionally find on his ranch. Now I’m not a rancher, but if I found a dead cow, obviously worked on by something, why would aliens come to mind as the cause? I could come up with dozens of other possible scenarios. It seems to me that if the earth was actually invaded by aliens, mutilating cows would not be their highest priority. creatures like Sasquatch and the Loch Ness Monster is one of the most popular. Why is that? Well, people are fascinated by such stuff because it is interesting but somehow manage to ignore the lack of evidence. About twice a year someone e-mails me and tells me they have seen an Ivory-billed Woodpecker. From their description and language, these people are not experienced birders. So Ivory-bills have been reported in backyards, on a suburban golf course, and even in British Columbia. When I tell them it is highly unlikely and suggest a photograph, I get huffy or silly responses like “I don’t carry a camera with me,” or “the government hides the sightings.” I always wonder why the “government” would hide data about the Ivory-billed Woodpecker. The Cornell Laboratory of Ornithology has offered a $50,000 reward for solid evidence of the Ivory-bill and it goes unclaimed. One person says he has a photo but won’t show it to Cornell to protect his rights – huh? Other bird myths abound –don’t touch a bird’s nest or eggs or young or the mother will abandon the nest; hummingbirds migrate on the backs of geese; young hawks learning to fly are caught by their parents if they fail; feeding birds rice at weddings will cause them to explode. If you devote a minute’s analysis to each of these, it’s easy to see why they don’t make sense. Same with Bigfoot, acupuncture, and aliens. There’s a pseudoscience called “cryptozoology”, literally “the study of hidden animals” and refers to searches for them. These hidden animals are never small obscure creatures such as insects or nematodes, or new species down in the dark depths of the ocean, but large creatures on land such as Sasquatch. Interestingly, there are few claimed cryptozoological birds. In the past there were Thunderbirds and the European equivalent called the Roc, both resembling a pterodactyl. In 1890 two cowboys supposedly shot one and dragged it into a saloon. A few reports of large predatory birds stalking humans have surfaced since then and I even had the privilege of investigating a sighting for a TV station many years ago in Illinois. A large bird “tried to take a baby out of its stroller” while it was parked in a backyard. The TV station was unable to capture a video of the kidnapping, but it did get a video of the menacing Great Blue Heron flying overhead! No doubt there are some animals, including birds, yet to be discovered. Except for the deepest parts of the oceans, newly discovered animals tend to be small and secretive and hard to find. If the Ivory-billed Woodpecker, Bigfoot, the Loch Ness Monster, or the acclaimed dinosaur-like creature of the Congo existed, we’d have some real evidence, but we don’t. None at all. 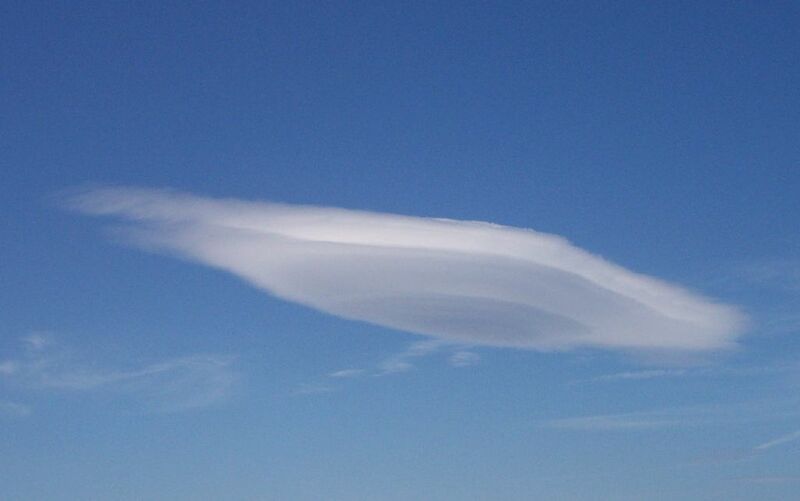 By the way, the photo above is a lenticular cloud. Go to Wikipedia at https://en.wikipedia.org/wiki/Ivory-billed_woodpecker for a really good overview with lots of references.No, its bill is not ivory, but ivory-colored. Habitat destruction, mainly logging. caused its demise. I have evidence of the ivory billed woodpecker. Whoever wants to see the bird can simply bring the 50,000.00 cash or cashiers check, to my house and drink coffee with me on my porch between 7 and 10 am during the months of February and the beginning of June or so and study them all you want. There are several here.I have made this offer to numerous people including the dept of wildlife and fisheries and so far have no takers which leads me to believe that the whole reward thing is a fraud.besides the fact that none of the reward posters and post offer specific instructions on how to actually collect the reward.anyway im not the one looking for the bird,they are.I already know where these are, they don’t. And they’ve been here for about four or five years. If you don’t see them keep the money. What do you have to lose?like I said, I’m not the one looking for them and if I was I would follow up on this. And bring my checkbook. Unless it’s a fraud.I see them every morning, same time same place. Like clockwork. I’ll give you a hint,Florida parishes area of south Louisiana. For more accurate location information put your money where your mouth is. Nobody has time to play games about a bird. I will give you a description of them.these are the biggest woodpeckers you’ve ever seen, they sound like Paul Bunyan chopping with a ten pound ax,they have solid red heads and don’t fly like the rest of the small normal looking woodpeckers around here.also they are very skittish. If you try to get near the tree to get a picture they take off and would require a pretty expensive camera that can take a clear picture from fifty yards or more which most people don’t have since the invention of the I phone, nor are they willing to purchase on a maybe reward from someone who claims to be willing to spend 50 grand for evidence of the bird but not willing to spend a few hundred on a plane ticket to see it with their own two eyes instead.which may explain the uncollected reward and lack of solid evidence. The evidence is in my front yard but if those seeking the evidence are too lazy to follow up on it then there probably never will be solid evidence because professional photographers have tried to get a good shot of one but haven’t been able to because as I said they are extremely cautious. And you would be too if you narrowly avoided extinction. But I’m not the one looking for it.I’m the one who can actually show it to the people looking for it.big difference. And if their too lazy to come see it they probably never will get the evidence their allegedly looking for. I’m beginning to think that they don’t want to find it.that they get government funding as long as its believed to be extinct and as soon as it isn’t they will be cut off. Its obviously worth more as long as you don’t follow up with people telling you where to see them.then it will be worthless from a government funding standpoint.and it won’t be the holy Grail either because the internet is full of sightings from experienced bird watchers so they are obviously everywhere and no one wants to go see one but they want to see one huhuhuhu.double talking jive get the money or shut up about it. There’s four or five right here every morning. Duuuuhhh.but don’t come see them huhuhuhu.clowns. So you think you have Ivory-billed Woodpeckers in your front yard? And nobody wants to see them? Well, first of all, Ivory-billed Woodpeckers do not have solid red heads but Pileated Woodpeckers do, so that’s very likely what you are seeing. Tell you what. Get a photo, even a bad one from 50 yards away, and if there is any indication at all these are Ivory-billed Woodpeckers, I will get on a plane, at my own expense, and take a look. And if you are correct, I will make both of us rich and famous. And I’ll bring my checkbook. However, if these are Pileated Woodpeckers, you reimburse me for my airfare. How about that deal? $50,000 against a few hundred bucks. Deal?